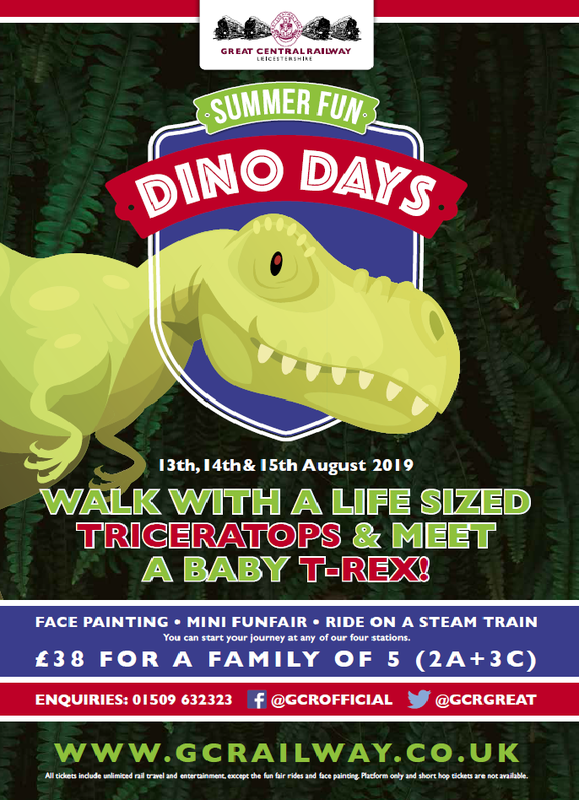 New "Dino Days" on 13th, 14th, and 15th August 2019. Tiny the huge Triceratops is simply jaw-dropping! At 5.5 metres long, he has an awesome presence and is adored by all ages. He loves playing follow-my-leader with a trail of tiny tots stomping along behind him! He also craves cuddles from any daring Grannysaurus! The Dino Babies are simply awesome and adorable! Everyone wants to stroke and photograph them! We have several in the family and each has a quirky character of its own! Come and meet them! Come on an adventure through our very own Jurassic Jungle where you can dress up as a Dinosaur Explorer and search for dinosaurs and fossils out in the wilds. Who knows what exciting things you might find! Photo ops, role-play, dressing up, interactive fun. Here you can watch the locomotive run-round the train. Start and finish your journey at any one of our 4 stations and hop on and off along the way all day long! Join any of our trains at any of our four stations, for a fun packed day for all the family. TRAIN FARES: (short-hop tickets and platform tickets are not available at this event). Loughborough: LE11 1RW. On street parking is available but the surrounding roads will be busy. Many double yellow lines have been added to roads in the area, so parking is increasingly scarce. Quorn: LE12 8AG. This is GCR's main car park. Rothley: LE7 7LD. There is very limited free car parking in the station yard due to the children's funfair and the designated disabled area.